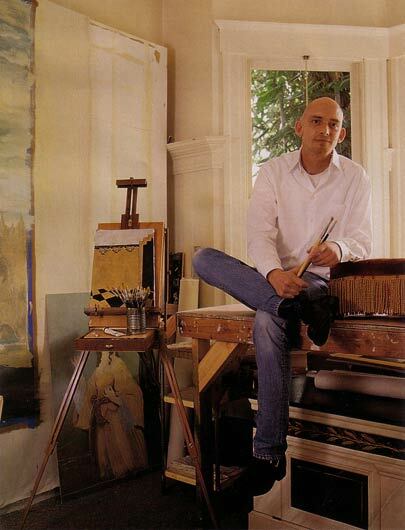 Michael Duté -artist and designer- is one of the world's premier decorative painters. His passion is for residential interiors with an emphasis on painted details and handcrafted appointments. He often conjures images of the past (Pompeian, 18th century French, etc) and creates powerfully evocative painted environments. These rooms convey a sense of mystery and romance. Michael Duté has worked extensively in San Francisco, the Napa and Sonoma Valleys, Las Vegas, the Caribbean and beyond. Herr Duté currently resides in Berlin where he continues to perfect his painting skills, where he enjoys the vibrant cultural scene on offer in the German capital and where he draws inspiration from the nearby palaces such as Schloss Köpenick and Sanssouci. He travels extensively and his painting commissions often lure him back to California where he has a loyal and enthusiastic following. Books- San Francisco Style, San Francisco Interiors, California Wine Country, and California Design Library-Bedrooms. Magazines- The World of Interiors, Elle Decor, House & Garden, Traditional Home, House Beautiful, Metropolitan Home, Northern California Home & Design, etc.